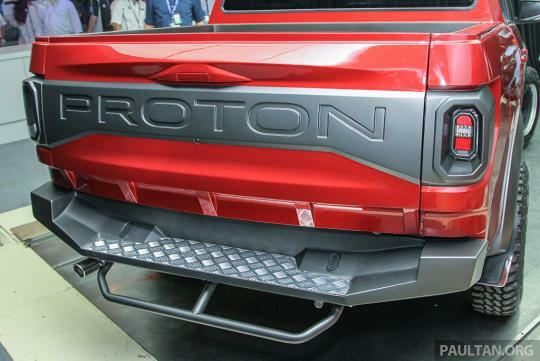 According to Paultan.org, Proton has revealed a concept pickup truck called 'Proton Pick-up Concept' and its based on the its existing Exora seven seater MPV. 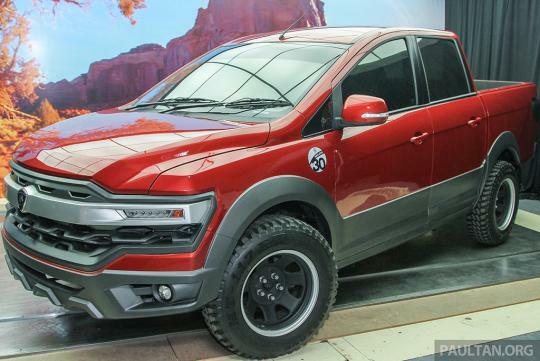 On display now at Proton's Alami event in Malaysia, the pickup looks very American and has hints of Ford's F-150 Raptor truck. Since it is based on the Exora, the interior is the same as the MPV and as of now, there are no plans on making a production version of the pickup. The head of design, Azlan Othman, explained the motivation to create such a pickup was because its Proton Wira based pickup, the Arena, did well in Australia. And since it made money, there was no reason to not look at that segment again. If this pickup does turn into a reality, it would be one of the rarer pickups that is front-wheel driven and has a monocoque chassis. Proton just as good as BMW, Putrajaya says. With that said....I read this page on this pickup with a pinch of salt. Front grille design quite cool. But where are the headlights ?? ok how much? use whose engine? It is still a study as of now, so the strip LEDs might be the actual headlights.